Sadie Navarro couldn't be more unhappy, her family is moving from San Diego to Bowie, Maryland, leaving behind everything that Sadie knows and loves. Sadie's dad is in the Navy and he is being deported to Afghanistan and before he leaves, he agrees to Sadie's purchase of a horse. Working with her grandmother, the two find the perfect horse for Sadie and Lucky is her newest companion and charge. One day, after showing Lucky on the Internet, how Sadie found her, the two are horrified to learn of ten horses being placed for auction. After reading about what may happen to them, like ending up in a slaughterhouse, Sadie is determined to save them from a horrible fate. Putting a plan into action, Sadie sets off to prove to the adults around her that she has the "moxie" to make this wrong into a right. With her presentation, her "clients" plight and her determination, Sadie enlists the help of her class and teacher, the news channel and even a state senator, to help her raise awareness to this situation. With the donations pouring in and interest in placing the horses into good homes becomes a reality, disaster strikes and throws Sadie off her game! Will everything work out in order to save the horses or will all of Sadie's hard work be for naught? I thoroughly enjoyed reading this story and think it is a great message to write about. The plight of horses is a topic everyone should know more. Often horses, at the end of their "run" or "use", are thrown to the sidelines, left to the whims of unsavoury people out to make a quick dollar and more often than not, many of these horses end up in poor living conditions and slaughterhouses. I think the strength and determination in Sadie is to be commended, I have met children who go above their means to make right situations that need recognition, I have been one of these children myself. However, in my day, the resources weren't as readily available as they are today, and I believe anyone who has a passion is able to manifest and make it happen. It was enjoyable reading about such a passionate young person, one with goals, instead of hanging out with the television, allowing it to think for them. I believe every young person should read this book, whether they like horses or not. It is a great introduction to the 101 grassroots advocacy that I wish many more of our young people would adhere. I loved how her parents and brother supported her and encouraged her to reach for her stars and with family support such as that, you can understand why she continued with her plans, even when, at times, she felt like she was drowning in her emotions. This is a great book for young folks to dig into, it will leave you laughing and crying as you think about the hardships some of the horses may be going through. Sales from the proceeds of "Believing In Horses", is being donated to the rescue organizations mentioned in the book, now that is a totally groovy idea and I commend Valerie Ormond on the writing of this book and bringing awareness to horse rescue everywhere!! First, the move to Maryland. Then Dad's deployment to Afghanistan. Sadie is in trouble. Then she gets Lucky, a new young horse who proves to be a handful. But that's just the beginning. 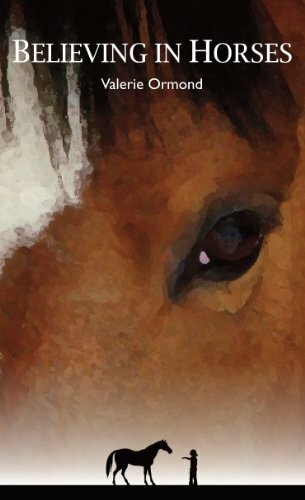 Together they encounter horse thieves, Maryland storms,and unwanted horses destined for auction and uncertain futures. Sadie makes it her personal mission to save them. Along the way she meets other people who are dedicated to rescuing horses. She also learns that some people in the horse industry are driven by greed. She's twelve. Can she save the horses in time...and herself? 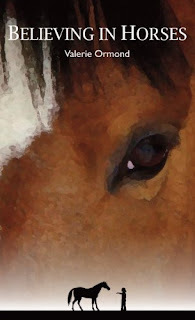 Visit Believing In Horses ~ Valerie Ormond~! !